Amlwch War Memorial on Anglesey - Casualties Names. Amlwch War Memorial is located inside the Amlwch Memorial Hall, and for the size of Amlwch it appears far less impressive than many of Anglesey's other superb monuments like Holyhead, Gwalchmai, Rhosneigr, and Llangefni School - to name just a few. That said, the War Memorial Hall is the actual memorial, but that - in my opinion - does little for those we wish to remember, as it is very often closed. 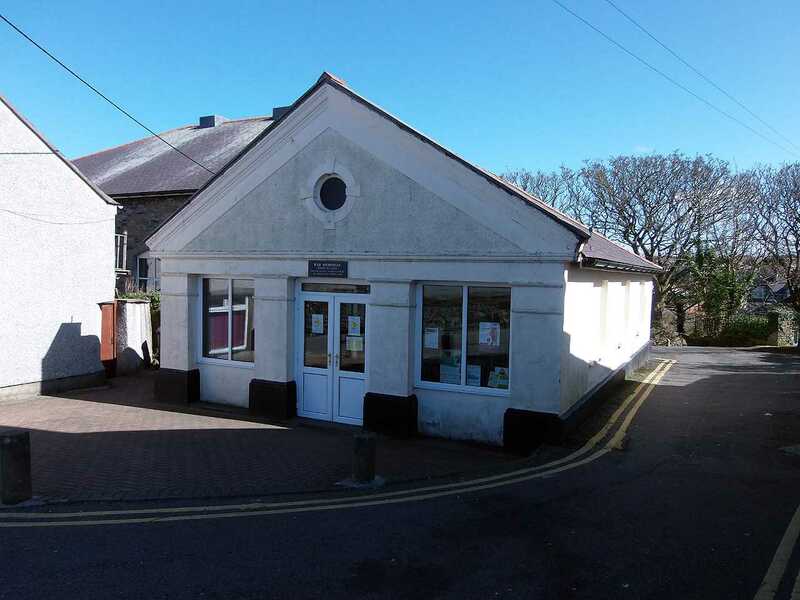 Anglesey, Amlwch War Memorial Hall. The other problem I have with this memorial is that there is such scant information, often not even the full names are quoted. There are no regiments, dates or house names on this memorial, and whilst everyone at the time probably knew who they were, it is almost impossible now. 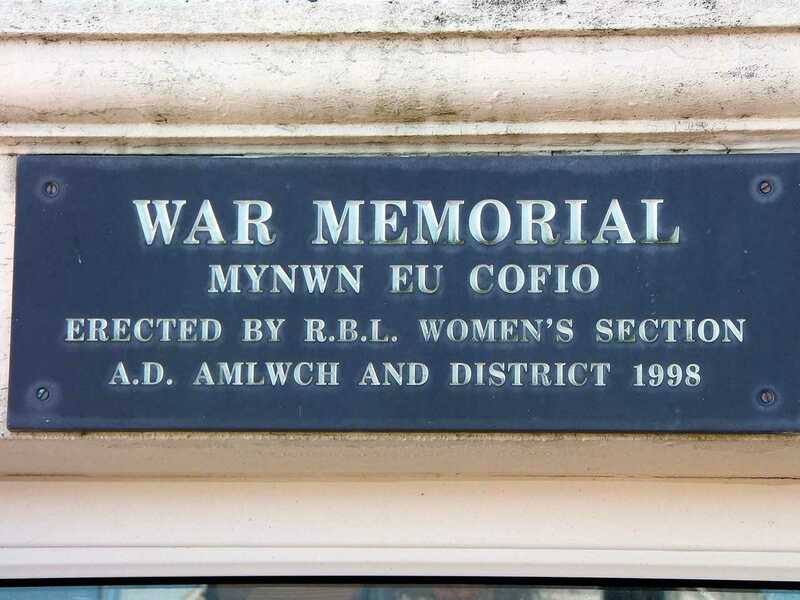 Anglesey, Amlwch War Memorial Hall - erected by the Womens Section of the Royal British Legion. To give these men a proper remembrance memorial I have put together - as much as I am able - a lot more information. I have presented this information in two tables below, each with enough details to identify which casualty we are referring to. There is one special hero amongst the bunch, Owen Evans of Craig Llooyd, Bull Bay,who was awarded the Military Medal for bravery, second only to the Victoria Cross. Unbelieveable that this is not mentioned on the memorial. There are tragic but interesting stories, for example on the 22nd May 1918 four Amlwch seamen were serving on the S.S. Red Rose - a steam cargo ship - travelling from Littlehampton to Le Havre with a cargo of government stores. She was torpedoed and sunk by U-Boat UB-57, and all four Amlwch sailors lost their lives. During the second world war David Lewis Roberts of Amlwch was Chief Officer on the S.S. Amicus, a steam cargo ship, they were sailing off the west coast of Ireland when they were torpedoed and sunk by an Italian submarine the 'Alpino Bagnolini'. David and another 36 crew lost their lives. 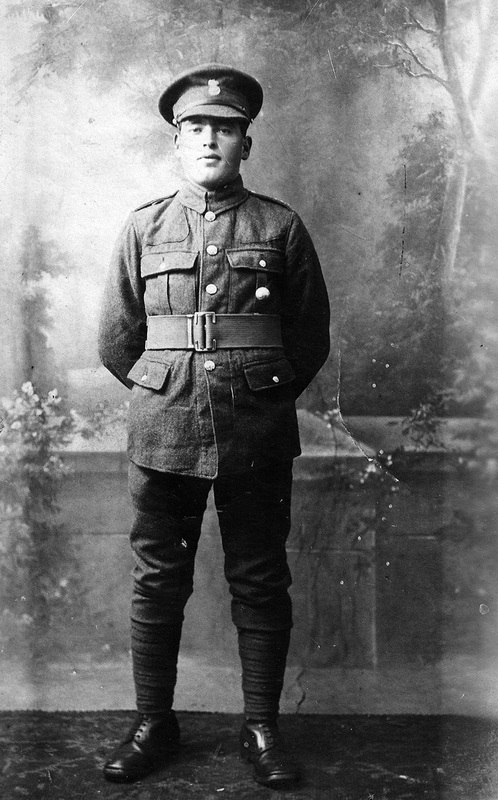 Richard Lewis Jones was aged 23, and a private in the 17th Battalion, Royal Welsh Fusiliers when he died on the 1st of september 1918 in France. He was buried in Ovillers Military Cemetery, also known as the 'Red Dragon' cemetery. He was the husband of Frances Jones of 19 Pentrefelin, Amlwch, and son of Richard and Ann Jones (nee Lewis) of Llanerchymedd. Richard was born in 1897 in the Rhodogeidio district of Llanerchymedd. Prior to joining up he had worked as a farm hand at 'Gwredog Uchaf', Rhodogeidio. He married Frances Evans of 'Minffordd', Pentrefelin, Amlwch, in June 1917. His wife's brother John was also killed in France on 22nd April 1918. (See 'Cewri fy Ardal'. His parents were Owen and Sarah Evans (nee Jarrett). webmaster's note: I am grateful to Mr. Emrys Jones for the information (and image) re Richard Lewis Jones, Emrys is Richard's grandson. Joseph Stanley Jones was a Chief Officer on the merchant steamboat 'Monmouth Coast'. On 24th April 1945 the boat had left Sligo in Ireland after collecting a cargo of suplhate when she was atacked 80 miles out and sunk by a torpedo fired from the german U-Boat U-1305 (Captained by Helmut Christiensen). Joseph was the son of Owen and Catherine Jones of Bull Bay, and had been a full time fisherman and a crew member of the Bull Bay Lifeboat. 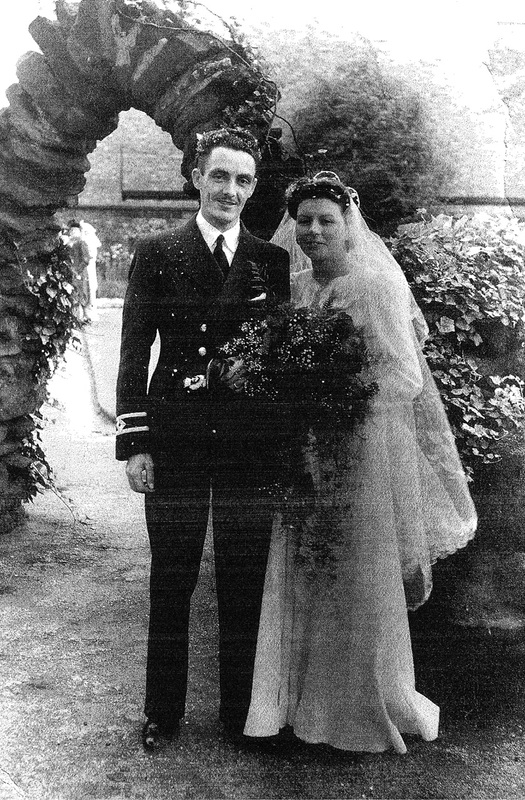 Joseph married Freda Helena Lomax in Garston, Liverpool in August 1942. They had one daughter, Diana, who sadly passed away in 2012. Joseph was one of three Anglesey men to perish on the ship, which lost 16 of the 17 crew onboard. The only survivor was Derek Cragg, a mess room boy. who was picked up by an Irish fishing boat. 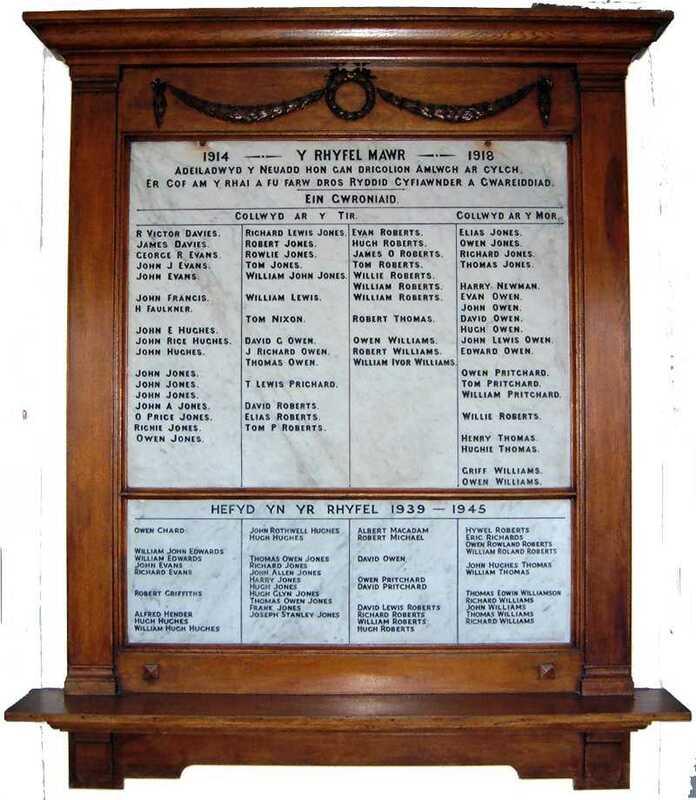 The two other Anglesey casualties were John Owen Roberts of Cerrigwinilan Bach, Penysarn aged 24 and the son of Owen and Maggie Roberts, he is remembered on the Penysarn War Memorial, and Benjamin Davies aged 36 - Second Officer - son of David and Ellen Davies of Llanddona, who is remembered on the War Memorial in Capel Peniol, Llanddona. On the 11th May 1946, a year after the sinking of the S.S. 'Monmouth Coast'. John Alan (Allen) Jones, the brother of Joseph Stanley Jones above, was killed aboard the S.S.'Greta Force', when she struck a rogue mine, near to the North Bishop Rock. He was 34 years old, and is also remembered on the Amlwch War Memorial. webmaster's note: I am grateful to Mr. Emrys Jones for the information (and image) re the Jones brothers, Emrys is the great nephew of the two brothers. There are several names that are on the list that are not on the memorial, and I make no excuses for that other than to say I believe they should be mentioned here. and the second table is here.